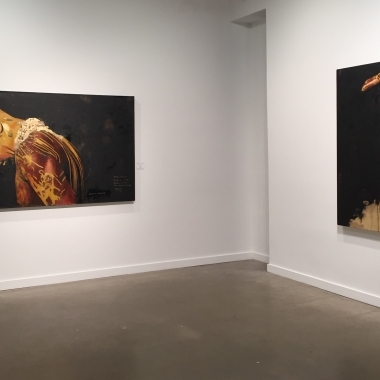 [New York] We are pleased to present “M E M O R Y,” a new exhibition of paintings, drawings and three-dimensional works by Fahamu Pecou. 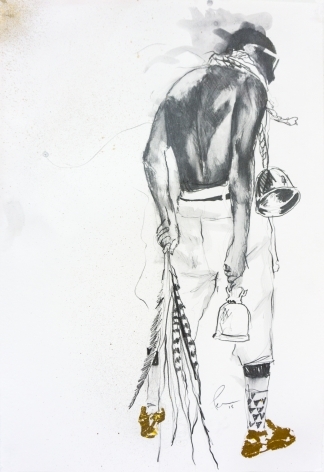 “M E M O R Y” evidences a conscious, nonlinear step into all periods and styles of Blackness. 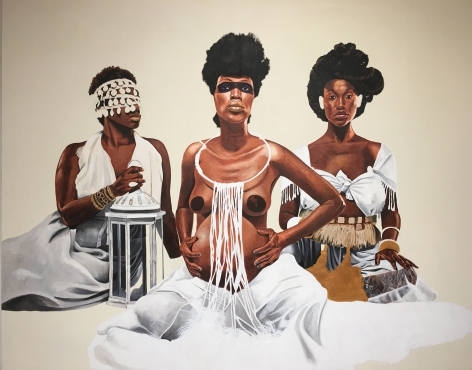 It is a shift away from Western notions of Blackness towards a decidedly Black aesthetic envisioning a fresh perspective on Black identity past, present and future. 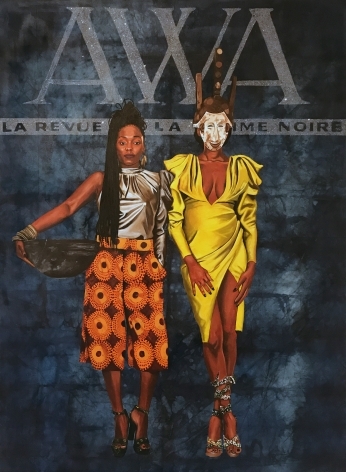 With “M E M O R Y,” Pecou depicts Blackness unbound - free from the confines and limitations informed by lingering misrepresentations of the Black body and prevailing misconceptions of racial inferiority, poverty and/or corruption. 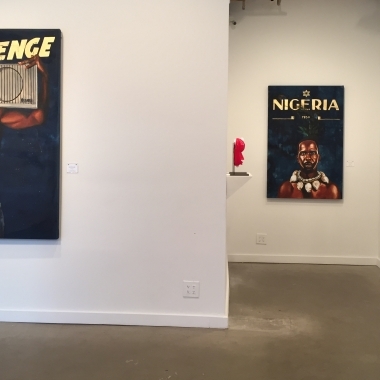 “M E M O R Y” also features readily identifiable signs and references from African culture. 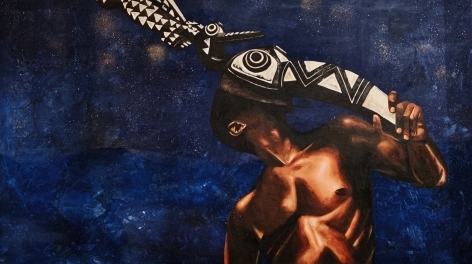 For example, in the painting titled MEMORY, the figure wears a cowrie collar and peacock feathers. Cowries are a common decorative element but are also revered as sacred objects and often used in rituals and divination in Nigeria and throughout West Africa. The peacock feather has long been associated with the orisha Oshun, a Yoruba deity who has come to symbolize aspects of beauty, royalty, and grace. 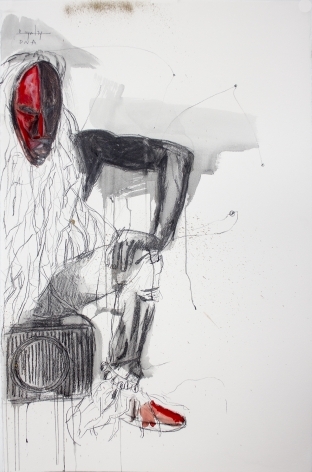 In GRIOT, the figure wears a mask attributed to the Dan tribe of Liberia. These masks known as ‘gle’ or ‘ge,’ are attributed to supernatural spiritual forces which interact with the physical world through masquerade. Three of works use diamond dust which calls into question the controversial and contentious diamond industry in Africa.Pecou adds a twist, by recreating these traditional masks through new age 3-D printing technologies. 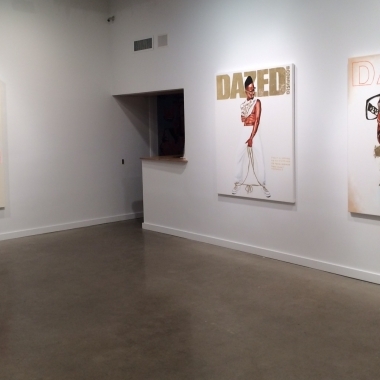 “M E M O R Y” is Fahamu Pecou’s seventh solo exhibition with Lyons Wier Gallery. 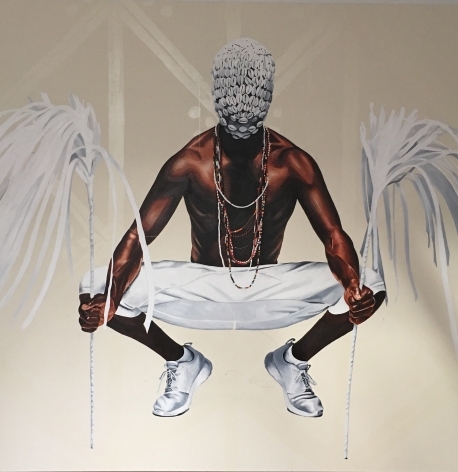 Pecou was the subject of a retrospective titled “Miroirs de l’Homme” in Paris in 2017. 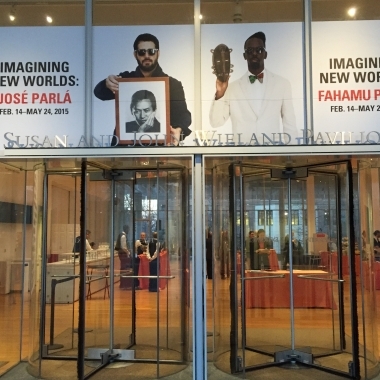 He has been featured in several solo and group museum exhibitions in the US and abroad. Museum shows including” Reclamation! 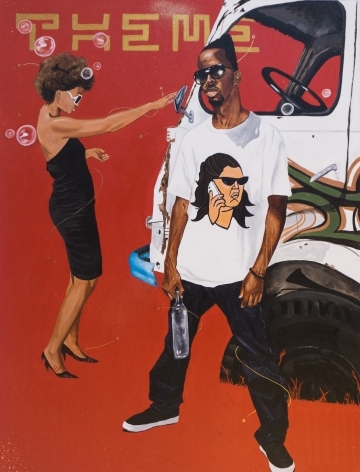 Pan-African Works from the Beth Rudin DeWoody Collection,” Taubman Museum of Art, Roanoke, VA, "Do or Die," Halsey Museum of Art, Charleston, SC., "Imagining New Worlds," High Museum of Art, Atlanta, GA., "State of the Art" Crystal Bridges Museum of American Art, Bentonville, AR., "GRAV-I-TY," at the Museum of Contemporary Art of Georgia (MOCAGA), "Southern Accent: Seeking the South in Contemporary Art," Nasher Museum of Art Duke University, Durham, NC., "Talking Drum," National Center for Civil and Human Rights, Atlanta, GA, "REMIX:Themes and Variations in African-American Art," Columbia Museum of Art, Columbia, SC., Torrance Art Museum, Torrance, CA, the Museum of Contemporary African Diasporan Arts (MoCADA), Brooklyn, NY, the Wadsworth Athenaeum Museum, Amistad Center, Hartford, CT, and Austin Museum of Art, Austin, TX. Pecou's work has been reviewed in numerous publications such as Art in America, Harper's Magazine, NY Arts Magazine, among others. 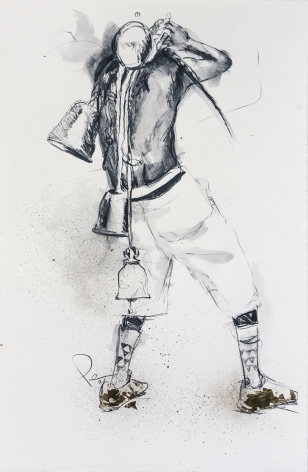 Pecou will be honored in 2018 with the NBAF Fine Art + Fashion Visual Artist Award. 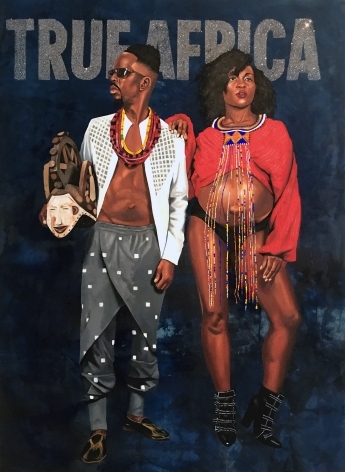 He is a recipient of the 2016 Joan Mitchell Foundation Painters and Sculptors Award, Artadia Award (2009), the first ever Artist in Resident for the Harvey B.Gantt Center for African American Arts & Culture Resident at the McColl Center for Visual Art in Charlotte, NC (2010) and a winner of the 2012 West Collection Prize. 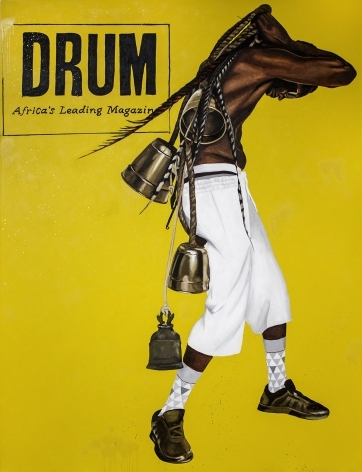 Pecou's work is featured in noted private and public collections including the Smithsonian National Museum of African American History and Culture, Washington, D.C., the Nasher Museum at Duke University, The High Museum of Art, Paul R. Jones Collection, Clark Atlanta University Art Collection, The Museum of Contemporary Art Georgia, The West Collection and Societe Generale, Paris, France, among others. Pecou will complete his Ph.D. degree at the Institute of Liberal Arts (ILA) at Emory University in 2018. The artist lives and works in Atlanta, GA.
DOWNLOAD Press Release: "M E M O R Y"
DOWNLOAD PDF Catalog: "M E M O R Y"